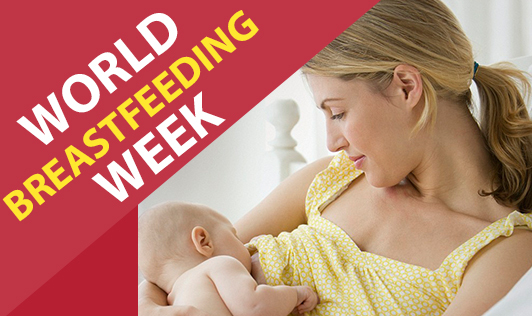 August 1 to 7 of every year is celebrated worldwide as Breastfeeding Week to promote this healthful activity for a new mom and a new born child. Exclusive breastfeeding for the first 6 months of a new born is being seen as an important step in providing a healthy future for the child. Although breastfeeding is a natural activity, some mothers are in a hurry to feed their infants through the bottle or to wean them to semi solid foods after 4 months. Breast milk is easily digested and absorbed by the baby. It provides all the required nutrients for a baby's physical and mental development in the right proportions. Provides great immunity against allergy. Places lesser burden on the baby's kidneys as the protein and sodium content of breast milk are not in excess. Breastfeeding provides a contraceptive effect to some extent to the mother. It helps the mother to reduce the pregnancy weight faster. Bonding between the mother and baby is better during breastfeeding.